I’m thrilled to be partnering with Dollar Tree to share their Summer Fun products with you. This did not influence my opinion in any way because all opinions are 100% my own. Summer is my favorite season of the year. We have lots of impromptu gatherings with friends and family. The warm weather and sunny days allow Husband and I to host some of the events with his large family because we can move the party outside. To make sure our guests can tell which house is ours in a neighborhood of small lookalike houses, I hang something cute, like paper lanterns, on the front porch. 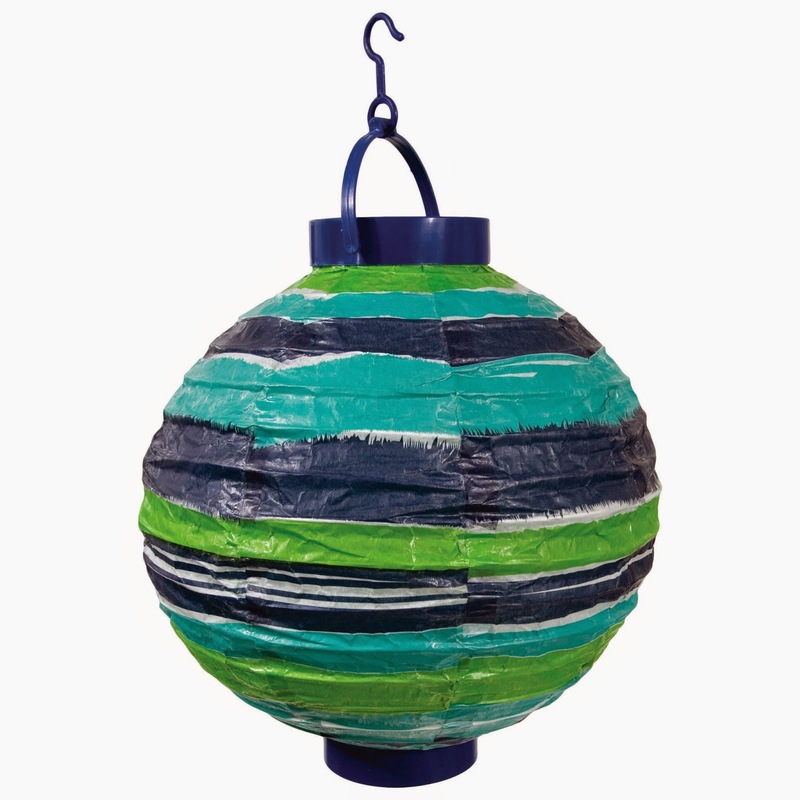 Striped LED hanging paper lanterns? Yes Please! Can you believe I found the lantern at Dollar Tree? Yep. 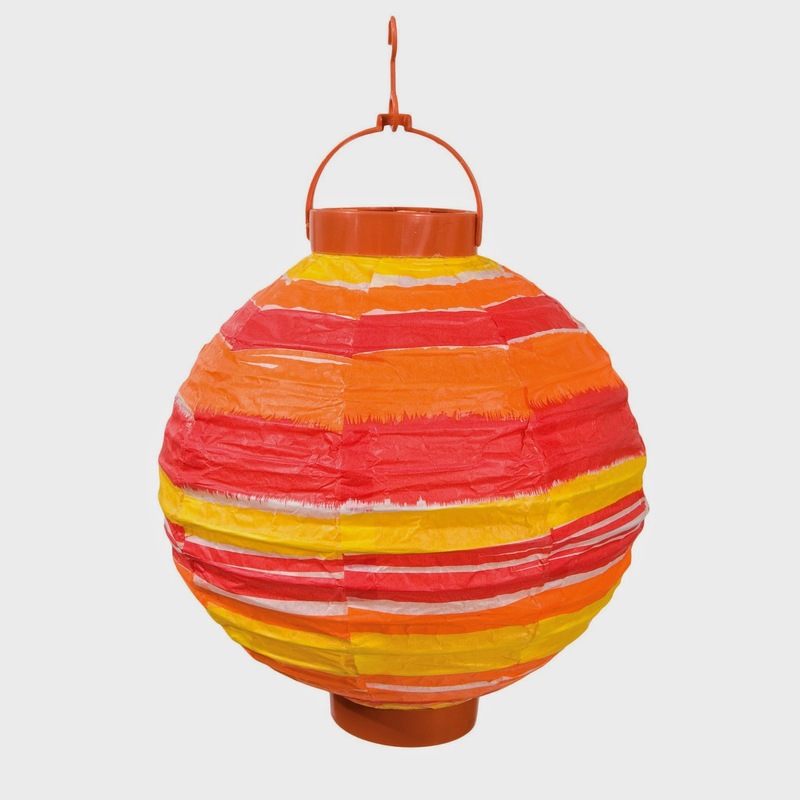 The lanterns are part of the new Dollar Tree Summer Fun collection of summer tableware, party supplies, toys, flip-flops and more things to make a fun-filled summer without breaking the bank because everything is $1.00. Other Summer Fun products to check out include round placemats, drying mats, table covers, and kitchen towels, in addition to the battery-operated LED paper lanterns. I like to use reusables over disposable as much as I can but until I make the storage space I need for a new set of reusable plates, which Dollar Tree also has for one dollar each! I can’t buy plates at a thrift store for that price. Dollar Tree’s Summer Fun plastic products include reusable plates, bowls, tumblers, and serving trays. In the meantime, I use paper tableware and compost it after the event. Since I’m buying, it might as well look cheerful and inviting. 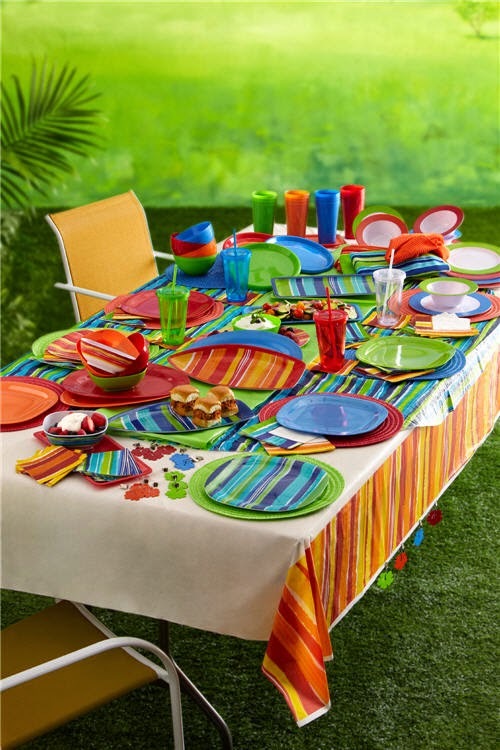 The Summer Fun tableware is available in six bright colors and patterns: red, orange, red/orange striped, green, blue, and green/blue striped. 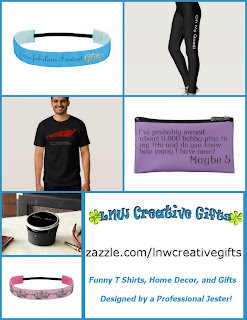 The quantities are limited and select items may vary by store but you can easily mix and match what is available in your store. Since I’m buying disposable tableware, it might as well look cute. It has to be inexpensive because we have a lot of people to feed at any given time during the summer. I also want it to be a step in an eco-friendly direction, like using these cheery paper-based cups instead of using foam cups. 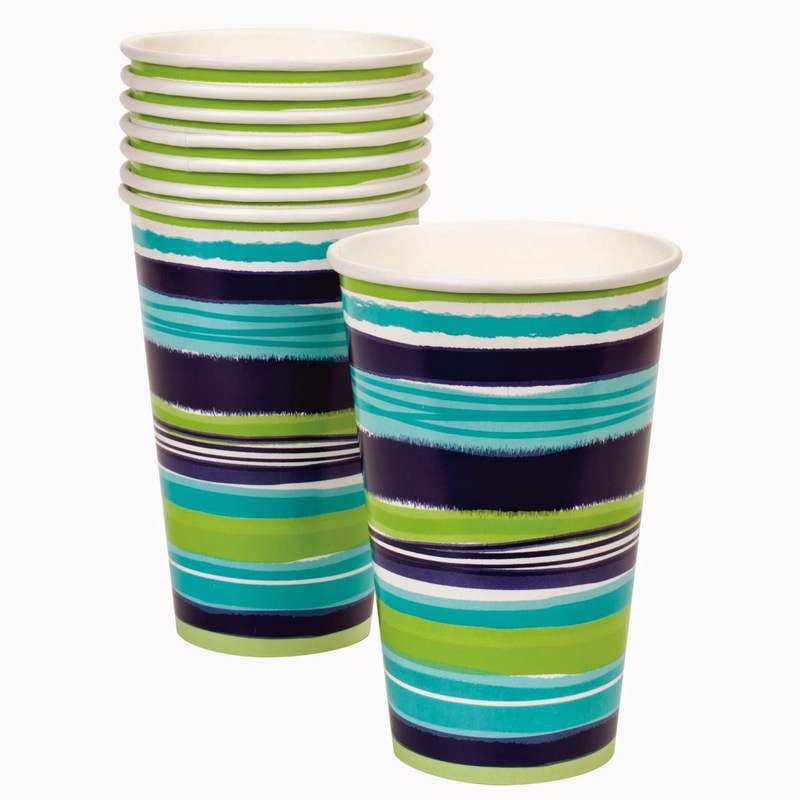 The Summer Fun paper products include striped napkins, cups, and plates. 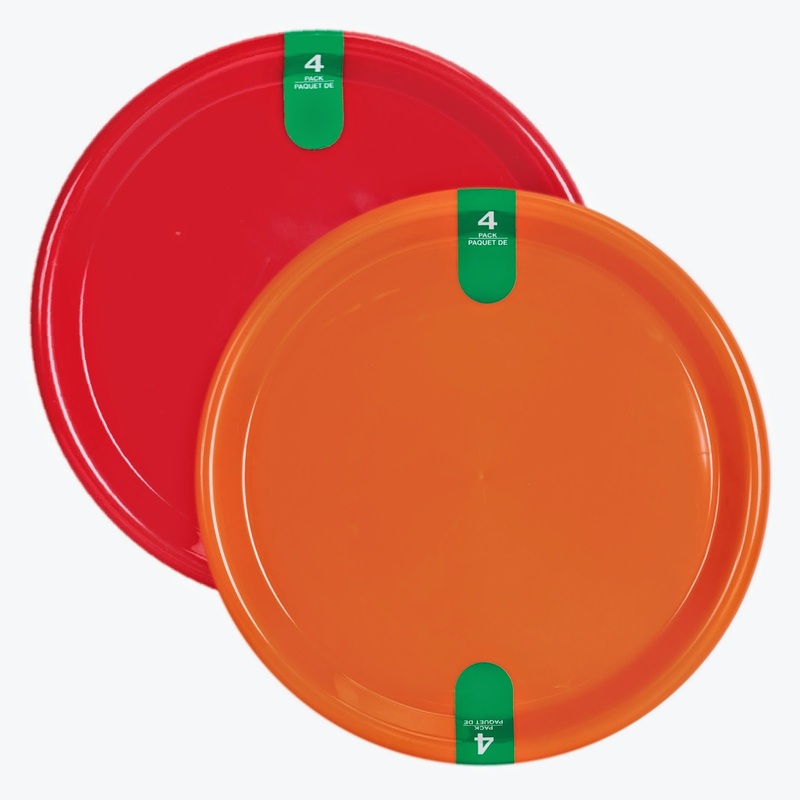 Dollar Tree sells many products such as plates and cups, in $1 multi-packs. The stripes are my favorite. I need to get over to Dollar Tree before everyone else buys them up! If I can’t recycle it or compost it, I select tableware I can reuse in some way after the event. 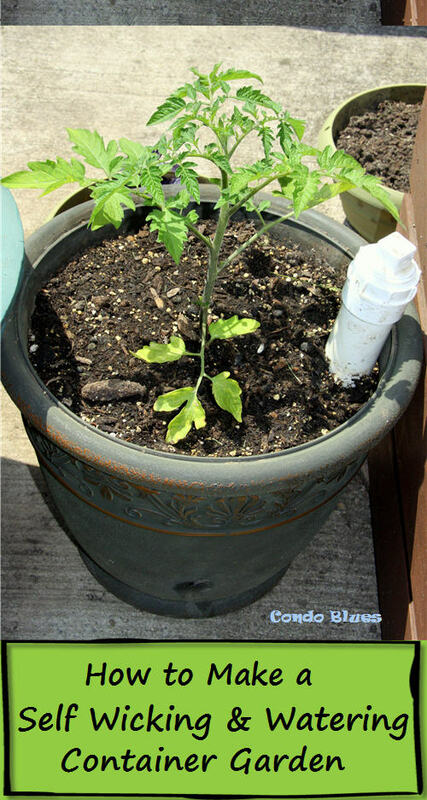 For example, the paper cups won’t compost due to the waterproof coating, so we would fill them with dryer lint and candle wax to make fire starters for the next party. At the end of the summer, the plastic tablecloth moves into the craft room. I will use it as liquid proof barrier under newspaper when I paint. Most of the time I wash and reuse the plastic cutlery from one summer to the next. If it breaks, the handles move into the craft room and I use them to stir paint. When I make more space in the kitchen, I want to replace the plastic ware with metal cutlery I found for two for a dollar at Dollar Tree. For more information about Dollar Tree’s Summer Fun products, visit Dollar Tree Sneak Peak. Purchase your favorite crafting supplies and flip-flops from Dollar Tree or DollarTree.com and create an original flip-flop craft. Submit a photo of your creation online at DollarTree.com and be entered to win a $500 Dollar Tree gift card! Join Dollar Tree’s free loyalty program, the Value Seekers Club, for exclusive crafts, recipes, and tip ideas every month. Visit ValueSeekersClub.com. Learn more about new Dollar Tree products and contests as an email subscriber. Sign up for weekly emails here. Get social with @DollarTree on Facebook, Twitter, and Pinterest!